Assessment and Development Centres offer a detailed and objective way of assessing your people's potential, whether you are trying to: ¢ establish training and development needs ¢ identify potential for promotion ¢ assess and select new recruits to your organization or using the centre in some other way. To make this assessment possible involves a huge investment in time, money and effort to plan, design, administer and run each centre and to effectively analyse and use all of the data it will generate. These three volumes are designed to help you set up and run your own assessment and development centres within your organization. Alternatively, if you already run centres, the manuals will allow you to evaluate and improve your administration, planning and assessment as well as to introduce new exercises. Volume 1: Planning and Administration contains important programme information such as: ¢ a range of reproducible assessment documentation ¢ sample programmes for an assessment and a development centre ¢ guidance on how to introduce and publicize your centres ¢ ’lecture notes’ for briefing participants and assessors ¢ an administrative blueprint, including flowcharts, to help you run your centres ¢ ideas for evaluating the success of your centres. Other Volumes: Volume 2 Assessment Activities Volume 3 In-Tray Simulations Each volume is available separately or as a three volume set. 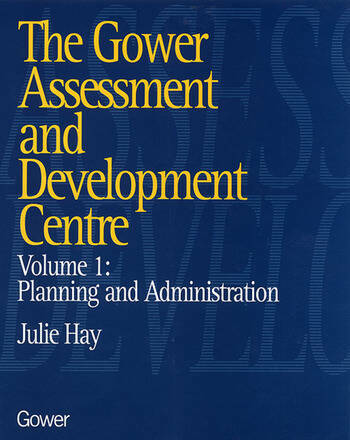 A short glossary of terms; Welcome to the Gower Assessment and Development Centre; The coding system. Part One Assessment Documentation: Assessment documentation: contents; Assessment factors: professionals; Assessment factors: management; Rating scale; Participant self-assessment; Observer record: individual; Observer record: group discussion; Assessment sheets without factors; Assessment sheets with professional factors; Assessment sheets with management factors; IN-TRAY marking sheet. Part Two Professional Development Workshop: Professional Development Workshop: contents; Development Centre outline; About the programme; Publicity materials; Running the Workshop; Programmes; Assessor/participant allocations; Follow-up day. Part Three Management Assessment Centre: Management Assessment Centre: contents; Management Assessment Centre outline; About the programme; Programmes and allocations; Administration and documentation; Running the programme; Additional activities; Final assessment and feedback process. Julie Hay has over 30 years experience in industry, government and the public sector and is currently Chief Executive of Training Consultancy AD International. She has been designing and running assessment and development centres since 1979, in organizations as diverse as airlines, insurance companies, local authorities, computer and IT companies and the probation service.